Café Crème Cigarillos have been made in the Netherlands since the 1960s. Having sold billions of units worldwide, they are some of the most popular small smokes around. Made with Indonesian wrappers and fillers from Colombia, the Dominican Republic, and Indonesia, Café Crème Arome cigarillos are infused with the robust flavor of aromatic coffee. I wish they make them sweet!!! This company provides an easy website to find and order a huge variety of cigars. There are flexible shipping methods and my order arrived on time and had the correct items. 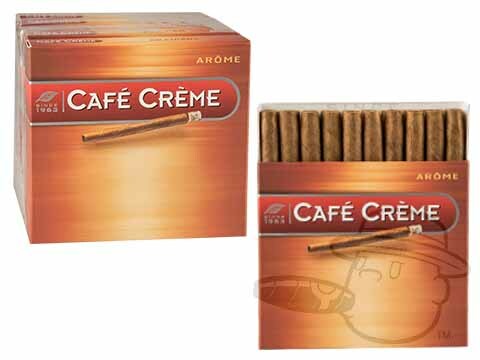 Cafe Creme Cigarillos Arome is rated 4.9 out of 5 based on 5 customer ratings. The other night I received a box of the Blue for my birthday. They were wonderful ... went too fast. I would like to try French vanilla and vanilla. I don't see them for sale. HELP! At this time we are not carrying the French Vanilla and the Vanilla flavors. We do, however, have the Cafe Creme, the Cafe Creme Arome, and the Cafe Creme Mild Blues, all of which are tasty mild-bodied cigarillos.